We examined the Direct and Indirect Effects model of Writing (DIEW), using longitudinal data from Korean-speaking beginning writers. DIEW posits hierarchical structural relations among component skills (e.g., transcription skills, higher order cognitive skills, oral language, motivation/affect, background knowledge) where lower level skills are needed for higher order skills and where component skills make direct and indirect contributions to writing (see Fig. 1). A total of 201 Korean-speaking children were assessed on component skills in Grade 1, including transcription (spelling and handwriting fluency), higher order cognitive skills (inference, perspective taking, and monitoring), oral language (vocabulary and grammatical knowledge), and executive function (working memory and attention). Their writing skills were assessed in Grades 1 and 3. DIEW fit the data well. 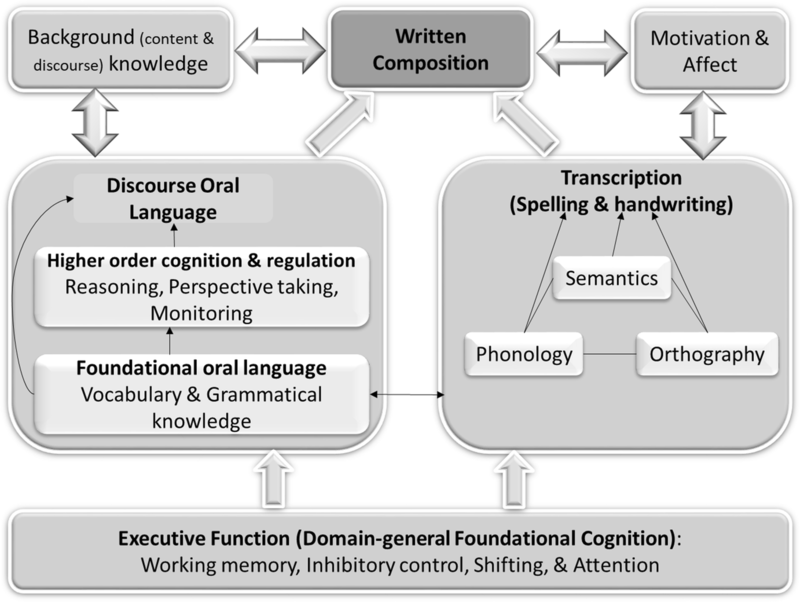 In Grade 1, transcription skills were directly related to writing, whereas vocabulary, grammatical knowledge, working memory, and attention were indirectly related to writing. 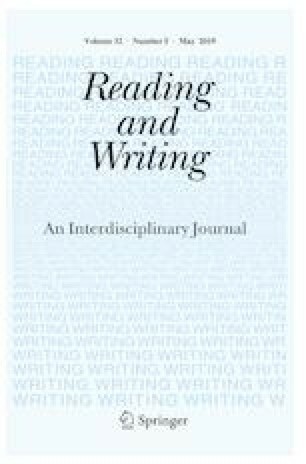 For Grade 3 writing, inference and spelling were directly related while working memory made both direct and indirect contributions. Attention, vocabulary, and grammatical knowledge made indirect contributions via spelling and inference. These results support DIEW and its associated hypotheses such as the hierarchical nature of structural relations, the roles of higher order cognitive skills, and the changing relations of component skills to writing as a function of development (a developmental hypothesis). Funding was provided by Institute of Education Sciences (Grant No. R305A130131) and National Research Foundation of Korea (Grant No. NRF-2013S1A3A2054928). Swanson, J. M., Schuck, S., Mann, M., Carlson, C., Hartman, K., Sergeant, J. A., et al. (2006). Categorical and dimensional definitions and evaluations of symptoms of ADHD: The SNAP and SWAN rating scales. Retrieved from http://www.adhd.net/SNAP_SWAN.pdf.